During setup, each player receives 4 recruit cards of which only 2 are kept. These 2 recruits will determine the player’s unique ability during the course of the game. Only 1 of the recruit is active at the start of the game however, the other is inactive till further requirements are met. Each player also starts with 2 dice which signify the player’s workers, and one secret agenda card. Euphoria isn’t played in rounds but played from turn to turn until a player reaches the game winning condition – placing 10 of their influence tokens on the game board. Each turn seems to flow rather quickly due to the simplicity of the options available. But the meat of the game comes from where you may place your workers, and what benefits they bring and costs they incur to you. 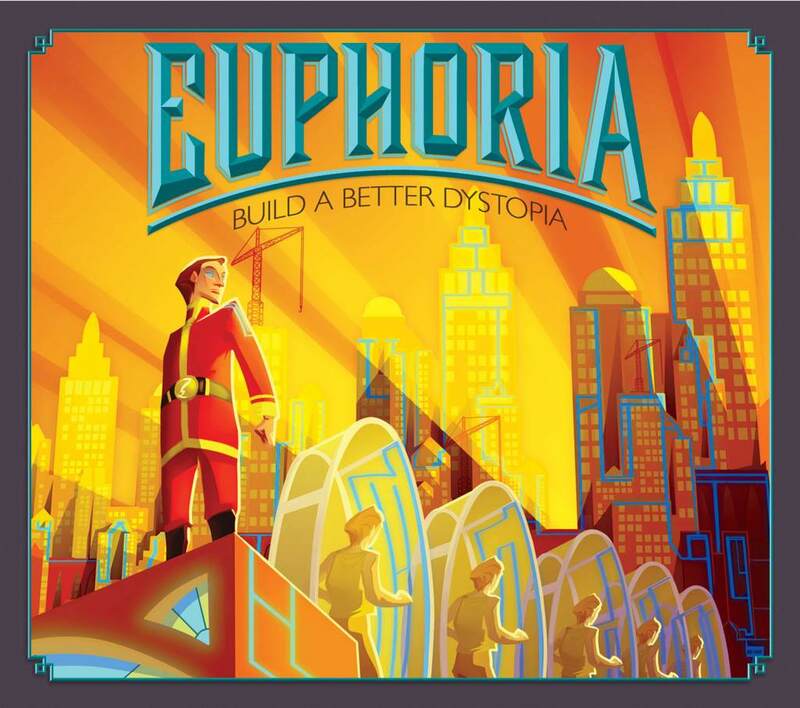 Euphoria also presents a slightly different twist to the worker placement aspect in games. In Euphoria, there are 3 different types of worker placement spaces. The first one is a temporary space where if one player has a worker placed there, the subsequent player may replace the previous player’s worker. So no blocking is involved, but you give the previous player their worker back at no cost. The second type of space is your typical worker placement space. Once taken, always taken until the player willingly gives it up or once the action is completed. So players keep taking turns to place or retrieve workers until someone manages to place their 10 influence tokens on the board, then that player is declared the best builder of a better ( or worse ) dystopia. The first thing that caught my attention for Euphoria was the setting and the art style. 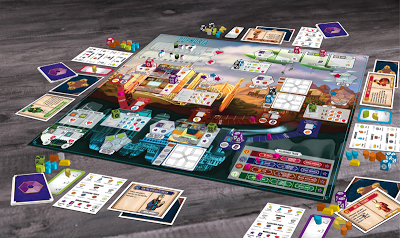 I loved the art in Viticulture and the same artist – Jacqui Davis – is doing a great job for the look for Euphoria. The setting of the dystopian world also appeals to me not because I am very much into science fiction, but rather, it is unique and different from a lot of other games out there. For those who listen to our podcast enough, you will know that I absolutely love individual player powers. And Euphoria has this by means of their recruit cards. There are 48 unique recruit cards so each game will play out differently and will encourage the use of different strategies each time. Love the idea. The market tiles in Euphoria bring a very small push your luck element to the game. They are assigned randomly and all face down, so you don’t actually know what market it is that you are attempting to construct. All you know is that, if you don’t construct it, there will be a penalty imposed on you that may be one that you really didn’t want to happen ( some of the penalties are much harsher compared to others ). There are 12 market tiles of which only 6 are used in each game. In Euphoria, one use of the dice values for your workers is that, if it exceeds your threshold ( which is determined by your knowledge level ), one of your workers will run away. This helps to ensure that players can’t just ride a worker-generation strategy to victory. Having more workers requires you to have proper planning and management, and of course some luck. The multiple recruits is a double edged sword to me. I love the variability and the options they give, but also, it seems that some of the abilities may not be very balanced. And if you know me, as much as I like player powers, I dislike imbalanced player powers. Euphoria is strange in a way that I start to wonder how it scales with fewer players. Most games have scaling problems with a greater number of players, but in Euphoria, it seems to be the other way round. The action spaces do not adjust to the number of players ( unlike how Viticulture does ), so I can see it being tight / just right for 5-6 players, but with 2-3 players it seems that everyone may be able to do something they want. There are a ton of action spaces on the board, and with everyone only starting with 2 workers, in a 3 player game, 6 workers can easily find themselves a home on the board. And this may significantly reduce the tension in the game. The secret agenda cards sound like something that I usually like in games, but this is hardly the case. The secret agenda cards are only different in name, artwork and requirements, but the benefits for completing them are the same. This is truly an area of wasted opportunity. Giving a one time benefit would have greatly made the cards more thematic and different from each other. At the end of it all, I decided to go ahead and make the push for Euphoria to be published ( not that it wont be published without my monetary offering anyway, haha ). I was greatly impressed by the production value for Viticulture, and I expect the same top-notch production value for Euphoria. If you would like to hear more about Viticulture and Euphoria, do listen to Episode 10 of our podcast where we interview Jamey himself and put him in the ( very ) hot seat.